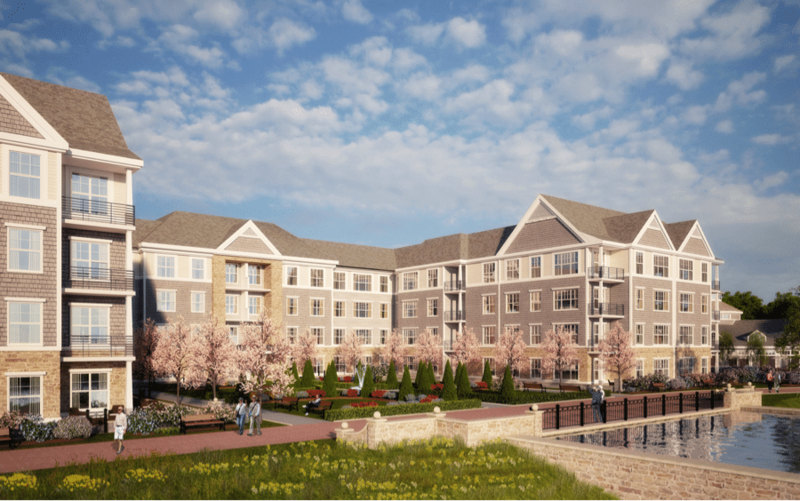 Many active older adults have been excited about the newest Life Plan Community (also known as a Continuing Care Retirement Community or CCRC) coming to Long Island. They are ready to embrace a worry-free, amenity-rich and energetic lifestyle at Fountaingate Gardens, and have acted on their excitement by making a fully refundable deposit to guaranteed priority placement in the proposed community. Fountaingate Gardens will cater to the lives of active seniors and offer a full continuum of care on site, should it ever be needed. Envisioned by Gurwin, a respected local leader in senior care services, Fountaingate Gardens will offer an innovative approach to retirement combined with proven Gurwin quality care, all in one scenic place. Now, after months of anticipation, we are offering a glimpse of what Fountaingate Gardens will look like in a newly released rendering, shown here of the Parkview apartment homes. The independent living community will be built after a Certificate of Authority to operate the community has been issued by the Department of Health and the requirements for construction have been met. With classic architecture, stunning landscaping with flourishing gardens, a pond, and many walkways, this rendering shows the splendor of what will be a fantastic community for an active lifestyle. Not only is our campus beautiful, but it is also conveniently located central to beaches, airports, Manhattan, shopping and more. And, with exceptional on-site services and amenities, it’s no wonder more than 200 active older adults have already reserved their spot at Fountaingate Gardens. By making a priority deposit today, you will become a member of the Fountaingate Gardens Charter Club, where you will be among the first to select one of the brand-new apartment homes, before that opportunity is presented to the general public. This exclusive group also receives special previews and first-looks as the community and residences take shape, while enjoying events and gatherings to meet their future Fountaingate Gardens neighbors. Fountaingate Gardens is more than just a retirement community; it is a home where you can maintain your active, independent lifestyle with ease. If you would like to see more renderings like this one, and or learn more about Fountaingate Gardens, please give us a call at (631) 210-5806, or visit our Information Center at 50 Hauppauge Road, Commack, New York 11725.